Rather cold this morning at 9:00 – 29 degrees. But the Eagles were flying. The fish were active and other predators were around. Namely hawks. It was snowing lightly, but the activity along the Boise River was good. 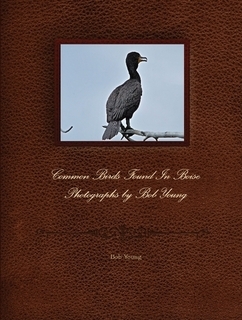 There was a report that there were several Eagles and yearlings further downstream from where I was. Robin was waiting in the car, hungry and cold. Best not follow up on that observation. I saw 2 adults and two yearlings, but only got to photograph the adults. Here’s what I saw. Keep Looking up! Left-Click any of these photos to see them enlarged. 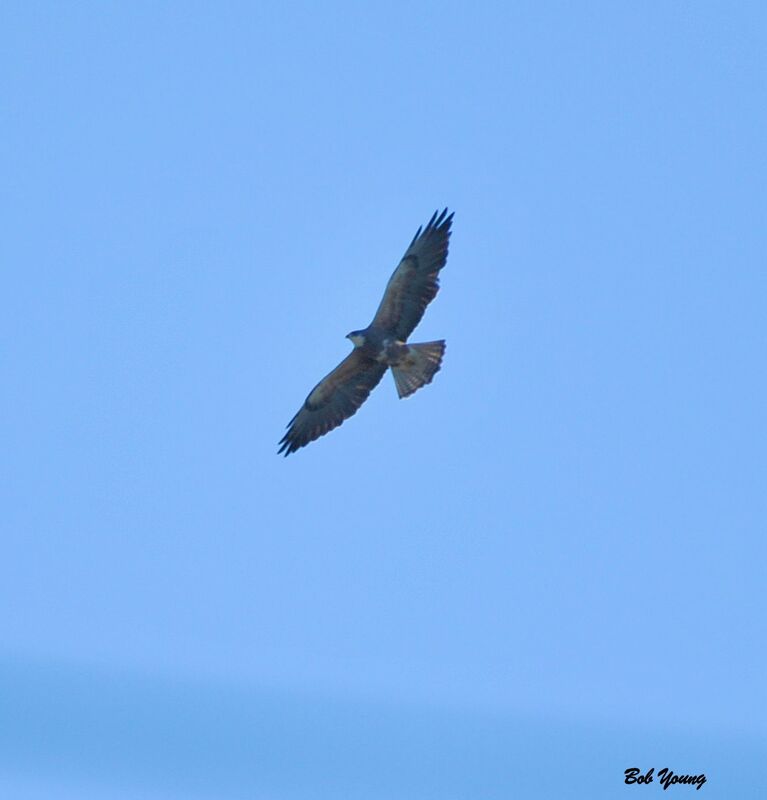 Can anyone ID this hawk? Thanks. The Boise River looking east from Barber Park. Eagle flying west – downstream. The Boise River has many fish. This beautiful juvenile Cooper’s Hawk was having dinner in the alley beside our house this evening. At about 5:30pm our neighbor called and said she saw the hawk take the pigeon and now her was on the ground eating. I grabbed my camera and these photos document what I found. Enjoy! And just to let you know, I have received no reports about the whereabouts of the Boise peregrine falcons. No news is good news. Left-Click any of these photos to see them enlarged. Juvenile Coopers Hawk at 19th and State Streets in Boise tonight. If you participate in Project FeederWatch, observed one of these two hawks during a FeederWatch count, and are not absolutely certain which hawk you observed, please report the bird as an “Accipiter sp.” (the genus in which these two species are classified). If you are going to participate in the Great Backyard Bird Count (GBBC), and this is a national event, you can get information from the site listed above. 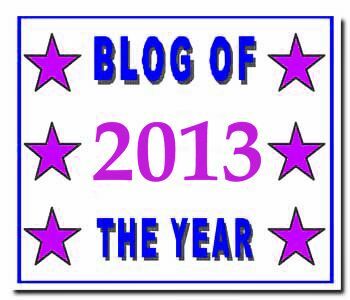 It is free and they do provide you with all the information and resource you will need. Cheers and Keep Looking Up! 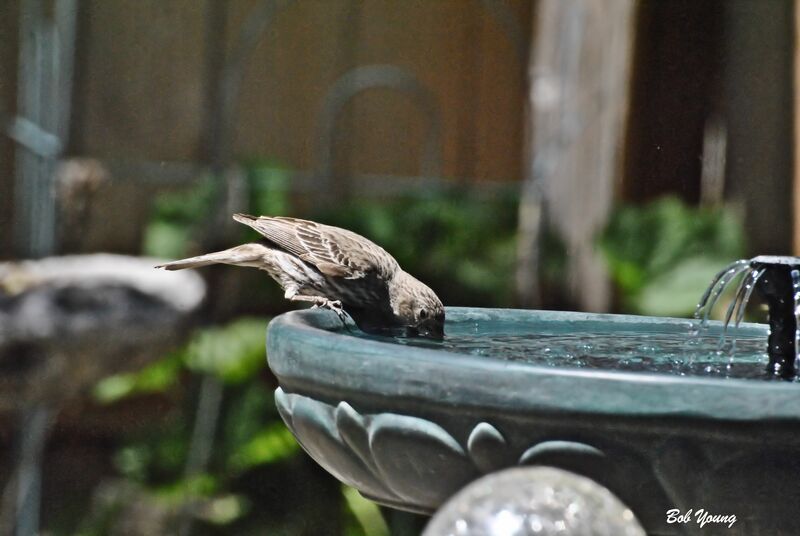 Our backyard feeders are doing their job – keeping us broke in filling with seeds! 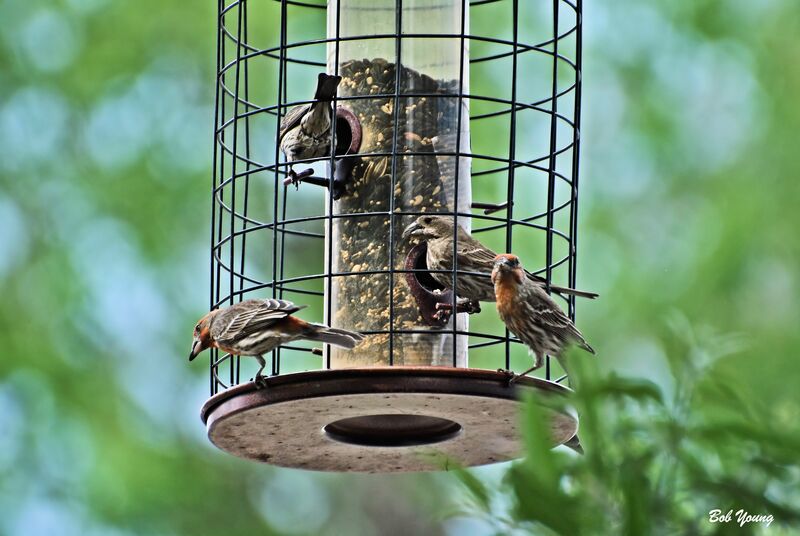 If you look in the sidebar for the National Bird Feeding Society logo, you can get some good info on backyard feeders. And, for your information, the Boise downtown falcons are doing good. The parents are “talking” to the eggs and rolling them. The signs look good for hatching soon – very soon. And while we are waiting for the first hatching, we watch our backyard. I have spotted 1 Black-chinned hummingbird, but only one. 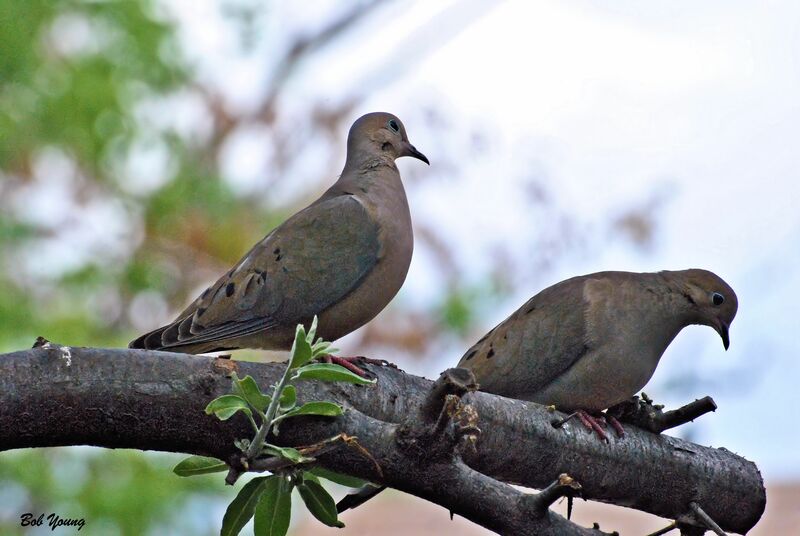 The Mourning Doves, pictured here, English Sparrows and House Finches are abundant. 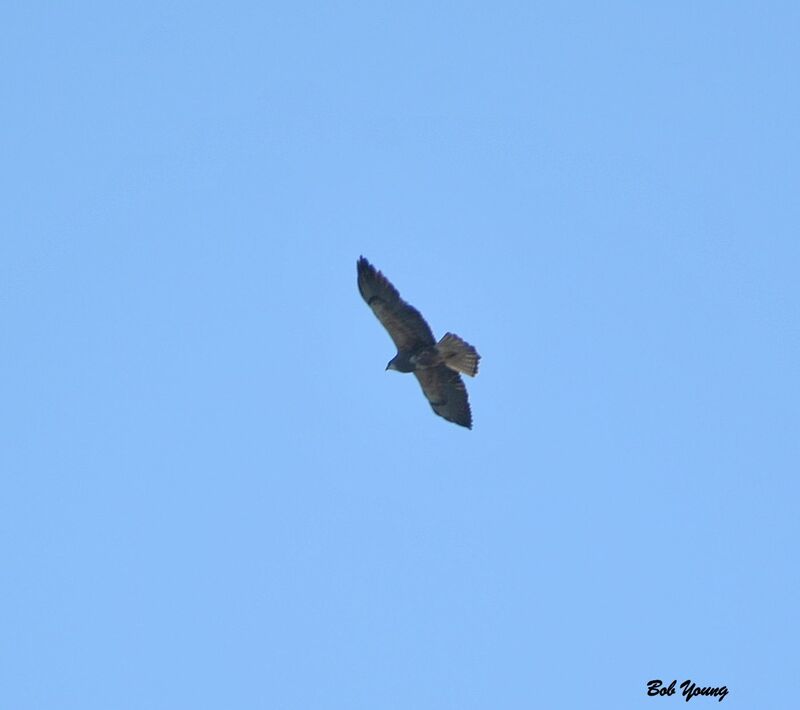 I even saw a Swainson’s Hawk soaring high over head. Here, take a look. Keep Looking Up and please VOTE above. Cheers! Left-Click to enlarge. 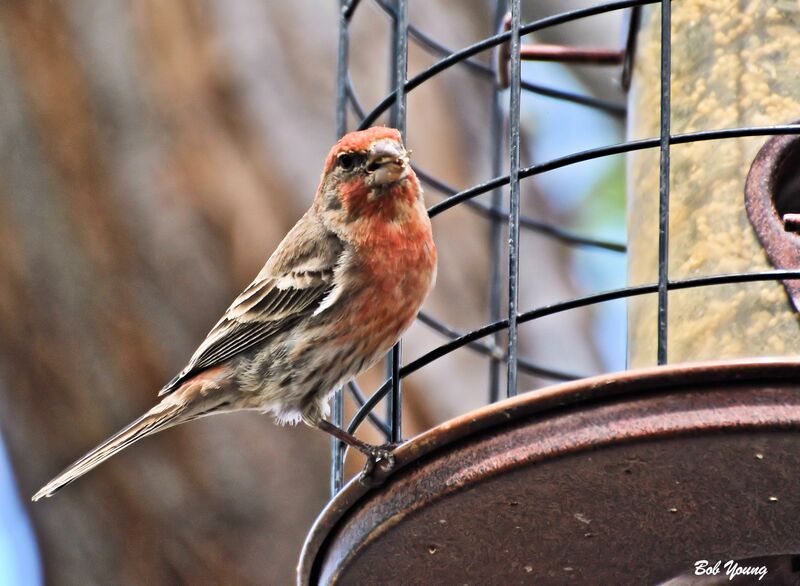 House Finches at one of our feeders. 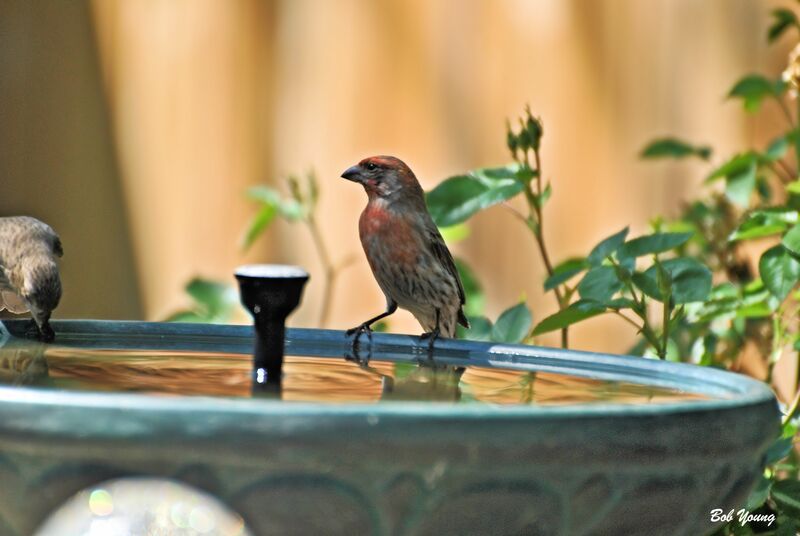 House Finch at our “Fountain Bird Bath”. It is solar powered. Swainson’s Hawk high overhead . Nice and warm today – 76 degrees here at the house. 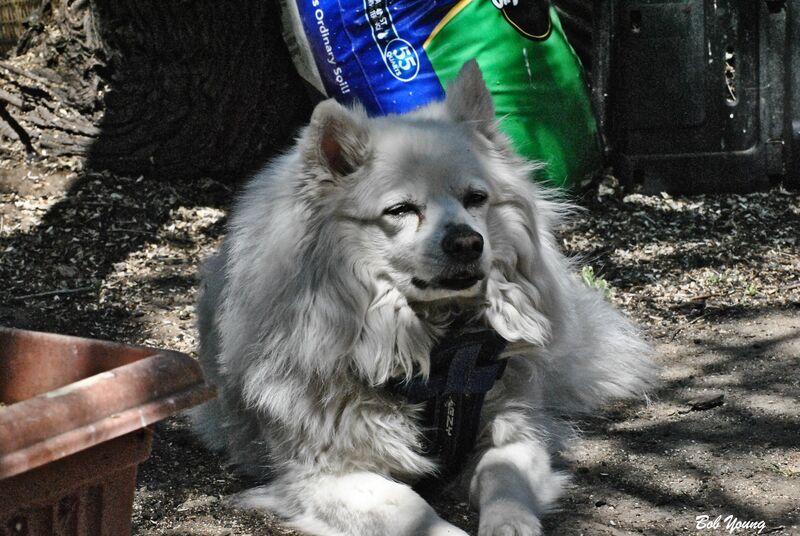 Even Buddy, pictured here, is a little groggy! 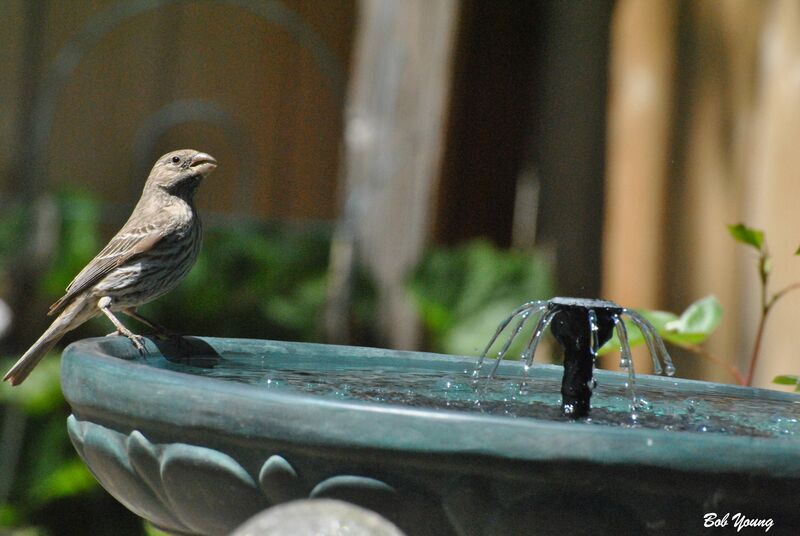 The backyard birds are active, at least when the Red-Tailed Hawk and the Sharp-shinned hawk are not around. Good to see the Rock Pigeons, Finchs, Sparrows, Siskins and even the Starling. I did see an American Goldfinch, but only for a fleeting moment. The downtown Peregrine Falcons seem to be doing fine. The eggs were laid April 1, 4, 6 and 8 so we should start to see hatching sometime this week. I talked to Deniz at the Idaho Fish and Game while at the Boise Bird Festival and she told me that the IDF&G will not be doing a fledge watch this year, as there is no longer money available for the Fledge Watch Team. (The fledge watchers were around many years before the coordinator of the team was a paid position. There is nothing to say that we can not continue in the “non-paid” mode.) Deniz said she would put me in contact with the person who took over for Bruce Haak when he retired, but I have not heard anything. She did say, though, that a phone contact person will be available 24-7. We’ll see. The Peregrine Fund posted this information the other day. A good read and good information. The eggs are now more than three weeks old and everything appears to be progressing as expected. When the male is not incubating during the day, he is busy fulfilling his role as protector and provider. To humans, the notion of sitting still for long periods of time during incubation seems intolerable, but for birds of prey of both sexes it is normal behavior. They do not waste energy. 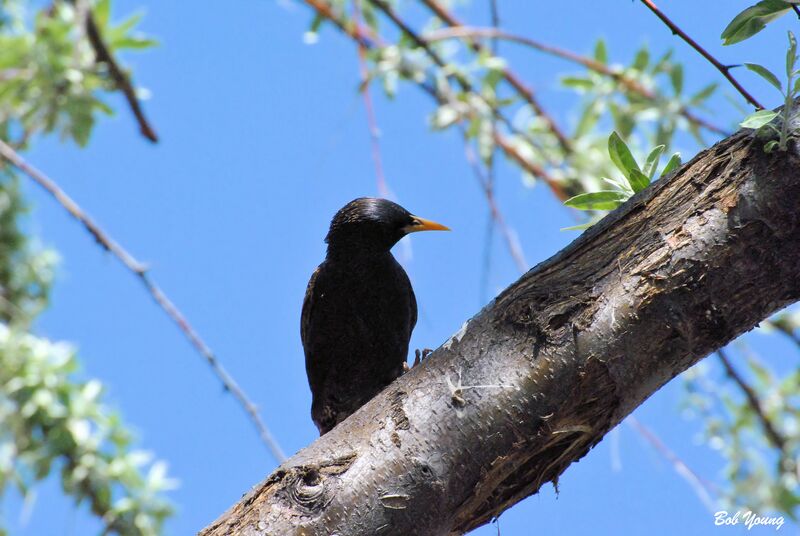 When birds are flying around, it’s easy to think that is what they do all day. In reality, birds of prey spend the vast majority of their time sitting still, conserving energy until it is time to hunt for food, attack or defend their territory, court, and raise their young. You may catch the falcons napping once in a while, but they are alert during incubation. 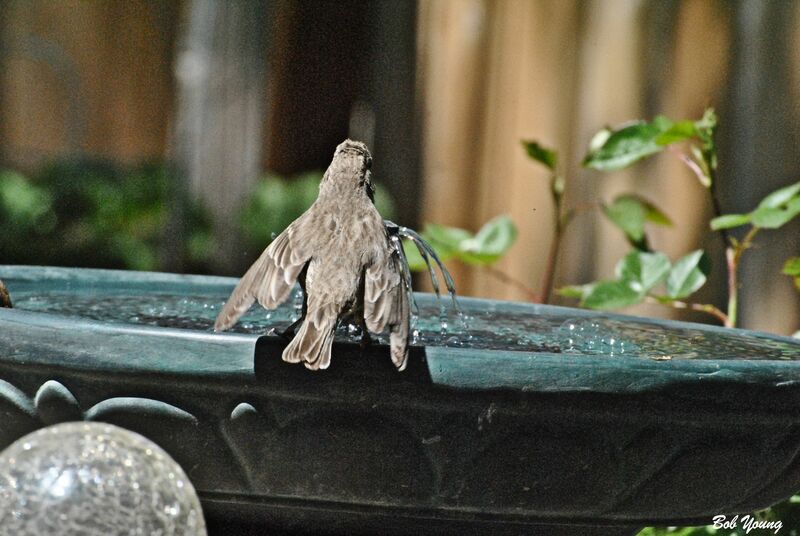 In the meantime, here are some photos of the birds that I saw in our backyard today. Not a spectacular sighting, but fun anyway. Enjoy and Keep Looking Up! Left-Click to see these photos enlarged. And please, VOTE above. Thanks. 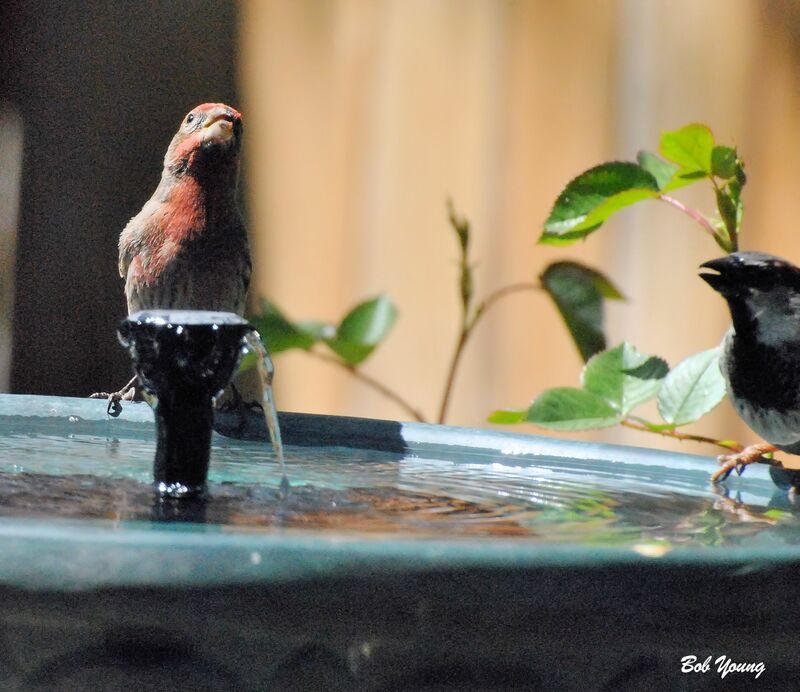 Finchs at the bird bath. They do like the solar fountain.